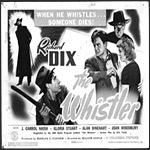 The Whistler whistled its way onto the airwaves beginning May 16, 1942 and its eerie 13-note theme set the tone for West Coast radio mystery for the next decade. "I am the Whistler and I know many things, for I walk by night. I know many strange tales hidden in the hearts of men and women who have stepped into the shadows. Yes, I know the nameless terrors of which they dare not speak."